The accolades just keep coming for Smith. Congrats J'Mar! WTG J'mar, who is the other player? 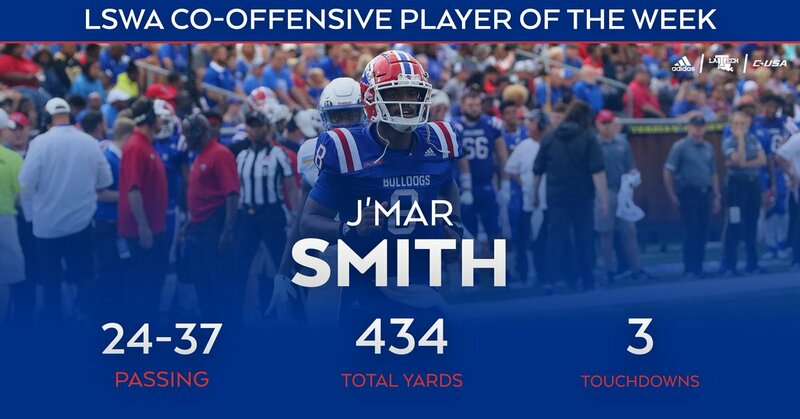 Really hope Week 2 J'mar is who we have the rest of the year. And not Week 1 J'mar. If we have W2Jmar we'll have a good shot at winning the west. Week 2 J'Mar played an extremely weak team. I'm happy with what I saw, but let's keep things in perspective. I hope he can continue things like stepping into the pocket, staying calm, etc. But we essentially know just as much as we did after Week 1. Give him that much time in the pocket and he will be the same. We need that with him throwing the ball in 3 or 4 seconds. You ask for week 2 J’Mar the rest of the year, that means we need week 2 OL protection and week 2 WR playmaking or better. There were some excellent catches made this weekend. There were also some a couple drops that couldve been made. Yep. Week 1 OL and week 1 WR were not very good. J'Mar was constantly running from DL & LBs, while the WRs refused to break off their deep routes. Both units were vastly improved in week 2 and it showed in the offensive stats and the final score.